Conjugation reaction between NHS-activated DSPE-PEG lipid with the amine group of ligand and formation of stable amide linkage. The micelles formed from lipid conjugated ligand and non-reactive PEG lipids are mixed together and the PEGylated lipids are post-inserted into the liposomes in order to form PEGylated ligand surface conjugated liposomes. 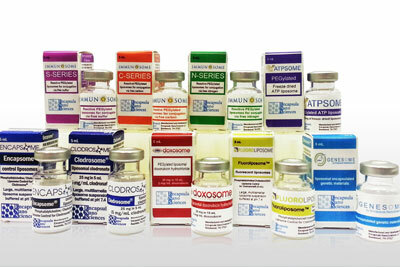 Immunosome®-NHS is a PEGylated product. 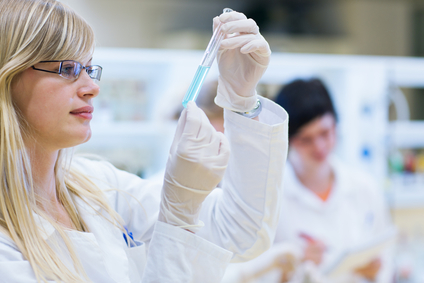 For other amine reactive (PEGylated and non-PEGyalated) products and also Immunosome® products suitable for other types of conjugation methods see here. The post-insertion kits come in two sizes; 2 ml and 5 ml. For the 2-ml kit size, dissolve the content of vial 3 in 100 µl of chloroform or methylene chloride. For the 5-ml kit size, the content of vial 3 should be dissolved in 250 µl of chloroform or methylene chloride. Transfer the solution to a 10 ml round bottom flask. Dry the chloroform using a rotary evaporator or under a stream of nitrogen, and make a dried lipid film. For the 2-ml kit, add 100 µl of PBS buffer to the dried lipid film. For the 5-ml kit, the amount of the added buffer is 250 µl. It is preferred to sonicate the hydrated lipid film using a bath sonicator and sonicate the micelle solution for 5 minutes. If you do not have a bath sonicator then hydrate the dried lipid film with PBS for at least 1 hour and constantly rotate the solution in the round bottom flask using a rotavap (not connected to vacuum) or by hand to make sure that all the dried lipid on the wall of the round bottom flask will go to the solution and form micelles. Alternatively, you can use a vortex to agitate the solution. The goal is to have all the dried lipid on the wall of the round bottom glass to go the micelle solution. Cover the mouth of the round bottom flask with parafilm. 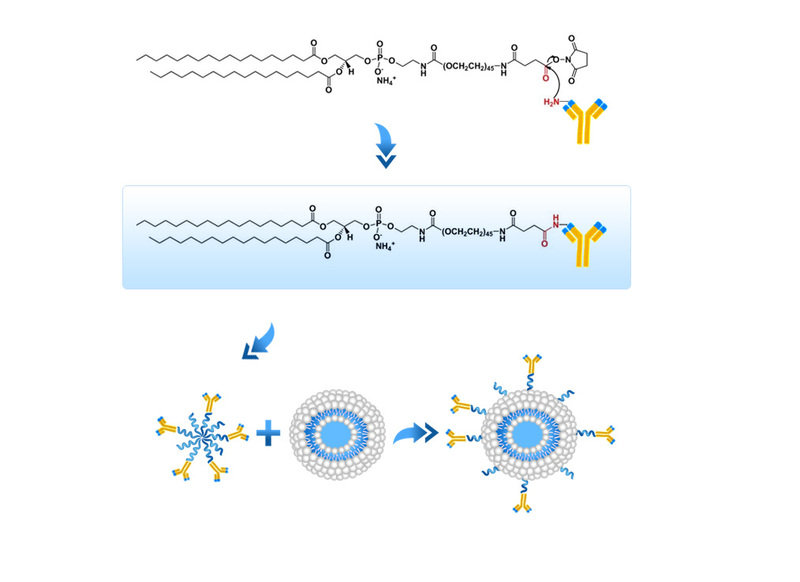 Refrigerate the micelle solution of non-reactive PEG lipids until it is ready to be mixed with micelles formed in step 4. For the 2-ml post-insertion kit, the amount of DSPE-PEG-NHS is 1.34 mg (0.22 µmol) and for the 5-ml of post-insertion kit the amount of DSPE-PEG-NHS is 3.34 mg (0.55 µmol). For the 2-ml kit size, dissolve the content of vial 2 in 100 µl of chloroform or methylene chloride. For the 5-ml kit size, the content of vial 2 should be dissolved in 250 µl of chloroform or methylene chloride. Transfer the solution to a 10 ml round bottom flask. Dry the chloroform using a rotary evaporator or under a stream of nitrogen. Add the water-soluble protein, peptide or ligand at 1:2 molar ratio of ligand to dried film of DSPE-PEG-NHS. For the 2-ml kit add 300 µl of water-soluble solution of protein of ligand in PBS (pH 7.4) to the dried lipid film and for the 5-ml kit add 750 ul of water-soluble solution of protein of ligand in PBS (pH 7.4) to the dried lipid film. It is preferred to sonicate the hydrated lipid film using a bath sonicator and sonicate the micelle solution for 5 minutes. If you do not have a bath sonicator then hydrate the dried lipid film with PBS for at least 1 hour and constantly rotate the solution in the round bottom flask using a rotavap (not connected to vacuum) or by hand to make sure that all the dried lipid on the wall of the round bottom flask will go to the solution and form micelles. Alternatively, you can use a vortex to agitate the solution. The goal is to have all the dried lipid on the wall of the round bottom glass to go the micelle solution. The solution is incubated at room temperature for 6 hours and in refrigerator for 24 hours. The reaction is pH sensitive. Read the technical note below for more information. Mix the micelles in step 2 to the micelles in step 4. The total volume of micelles for the 2-ml kit should be 400 µl and for the 5-ml kit should be 1000 µl. Immunosome®-NHS (PEGylated) post-insertion kit comes in three vials: vial 1 is a white translucent liquid made of nano size unilamellar liposomes which does not contain any reactive of non-reactive PEGylated lipid. Usually due to the small size of liposomes no settling will occur in the bottom of the vial. Vial 2 contains reactive DSPE-PEG(2000)-NHS lipid in white powder form. Vial 3 contains non-reactive DSPE-PEG(2000) lipid in white powder form. Immunosome®-NHS is made on daily basis. The batch that is shipped is manufactured on the same day. It is advised to use the products within 4 months of the manufacturing date.